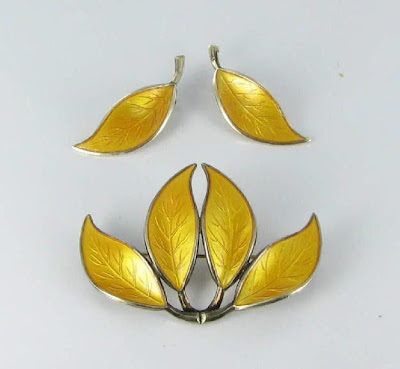 Sarah Coventry Vintage Jewelry was sold by the party plan during the 1950 to 1970s. Each piece was given a design name. Knowing the name of the piece will allow you to date it since the designs were made for a limited number of years. Many of the resource books will tell you the date of the piece if you know the name. My favorite research book on Sarah Conventry jewelry is " Emmons and Sarah Coventry Jewelry Fashion Show - Deborah A. Robinson." This is a video that I put together on YouTube which shows 13 pieces of Sarah Coventry jewelry from the middle of the last century with design name and date of manufacture. 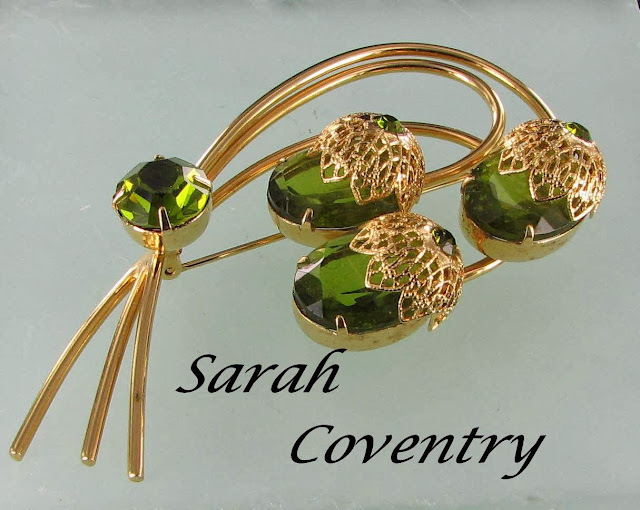 Most Sarah Coventry jewelry designs are quite collectible today. For a great range of Sarah Coventry jewelry, please visit Vintage Jewelry Lane. Sarah Coventry jewelry is one of the specialties of my site. 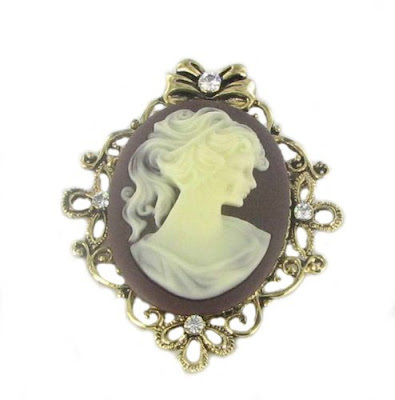 Sarah Coventry jewelry is well known and very popular with collectors of vintage jewelry. Each piece is well made and has come to be known by the name that the designers gave to it. This piece, for instance is called "Touch of Elegance." I think the name fits beautifully. The jewelry was originally sold by the party plan in the 1960s and 70s. But don't let that fool you into thinking this is not good quality jewelry. It has stood the test of time and many pieces are in the same condition as when it was made. One of the specialties of my website is Sarah Coventry jewelry. You can see the full range at Vintage Jewelry Lane. I've put together a video on my YouTube channel showcasing some of the Sarah Coventry piece from the 1960s and 70s. The video has music. Grab a cup of coffee and Enjoy! David Andersen jewelry is a family operation that was founded in 1896 and has been handed down through the family ever since then. 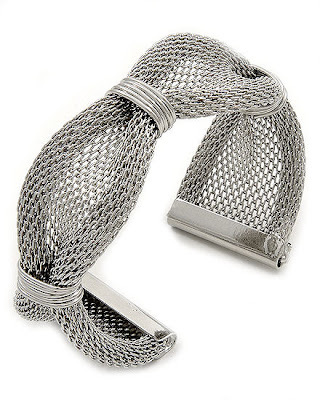 The designs are very high quality and also very collectible, particularly among collectors of Scandinavian silver jewelry. Designs are the work of many silversmiths but all have only the David Andersen mark on them. 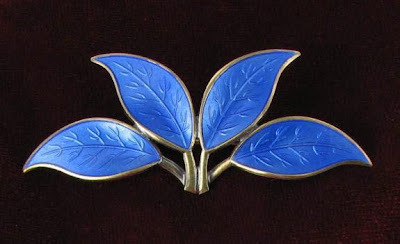 David Andersen jewelry is famous for their Basse-taille leaf pins which were made in most jewelry styles - bracelets, earrings, necklaces, brooches and sets. picture logo of tongs and a hammer (late 19th century). The last three markings were all used Mid 20th century until now. For those who collect, all David Andersen pieces are good investments. 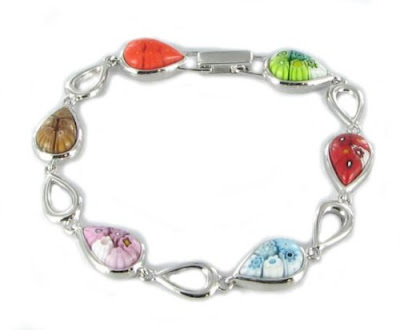 For the best investment, be sure to examine the enameling to make sure it is in good condition. Look for older pieces with the D-A 830S markings and also look for vintage sets in their original boxes. Vintage Jewelry Lane has a nice range of David Andersen leaf jewelry. You can view them on this page of my website. Do you collect Scandinavian silver? Who are some of your favorite designers? Who Doesn't Like Jewelry Bargains? Today is Thrifty Thursday. Let's take a stroll through my shops on the lookout for jewelry items less than $10. Grab yourself a bargain. 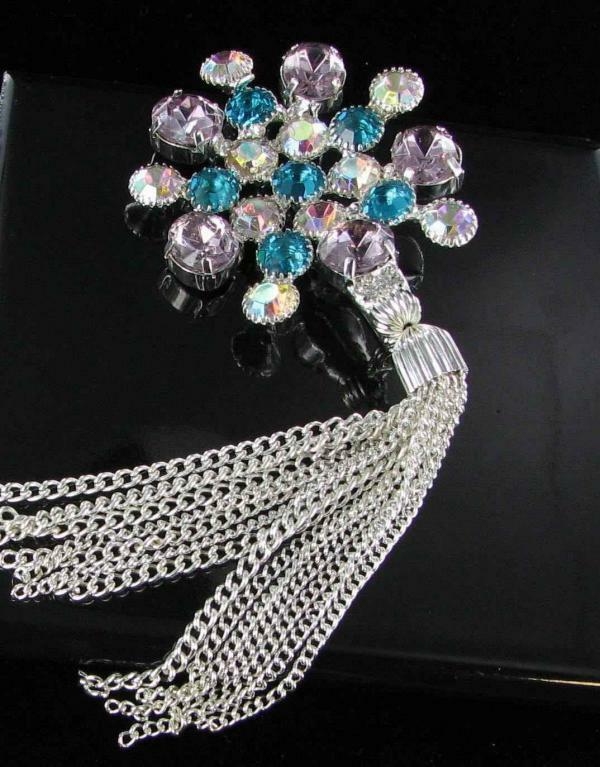 All items available in my Amazon shop - Jewelry Lane. You can find all of these and many more bargains in my new Amazon Shop - Jewelry Lane. Just click on any of the links above for more details about the items. When you shop for jewelry, what is your primary consideration? Style or price? Let us know in the comments below. Collectors of Vintage jewelry know that one of the most daunting tasks is dating a piece. No one method will give results for all pieces, but there are six commonly used techniques. Signatures. This signature on a vintage jewelry piece will offer valuable clues to dating it. 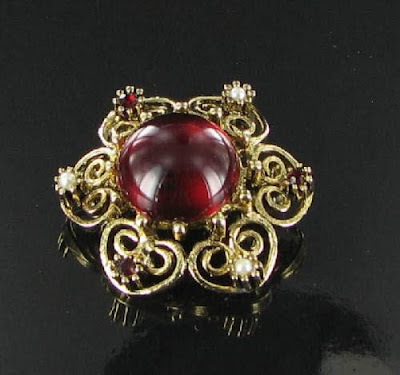 Many designers of vintage jewelry only made pieces during a certain time period. Copyright symbol. Many jewelry designers applied for patents for their pieces to keep them from getting copied. Both signature marks and actual designs were patented. A study of patents will give exact dates if the designs were copyrighted themselves. Signature Variations. Most designers used a variety of signatures on their pieces over the years. A good knowledge of the progression of these signatures can help pinpoint a design within a long time period. Dating by style. Vintage jewelry is like any other fashion style. It has certain characteristics which were trendy at various time points during the 1935 to 1980 span, which is considered vintage. Many vintage jewelry advertisements were used during this time. Locating an ad for your piece or one like it will give an approximate age of the piece. Resource books. If you are serious about collecting vintage jewelry, it will help to have a library of resource material. Dating from the original source. Provenance is defined as the original source. In vintage jewelry terms, this would mean dating a piece with information obtained from the original owner of it. If you are lucky enough to purchase an estate from the original owner, you may be able to get a lot of information about when it was originally purchased. How lucky that would be. 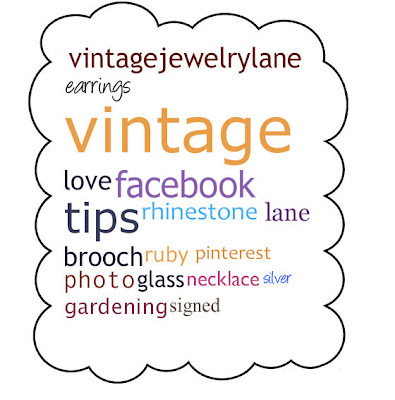 Have you discovered other methods for dating vintage jewelry? I would love to hear from you in the comment section below. New Napier Book Just Released. 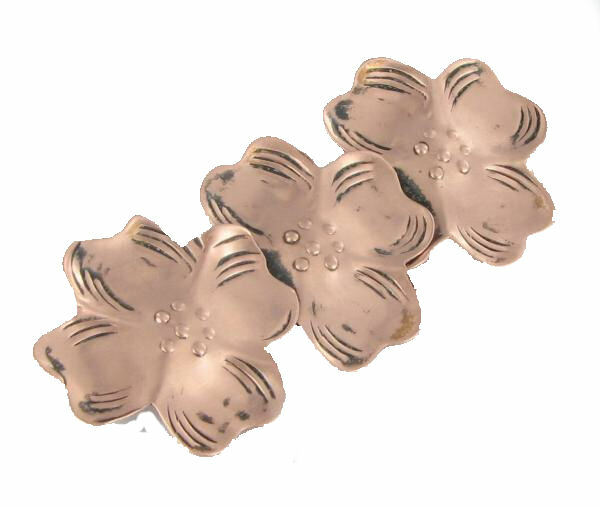 Napier Jewelry is a fairly well known design mark for later 20th century jewelry. While they are not one of the most collected designers, the company did put out very well crafted jewelry that stands the test of time. I sell quite a lot of it in my various online stores. 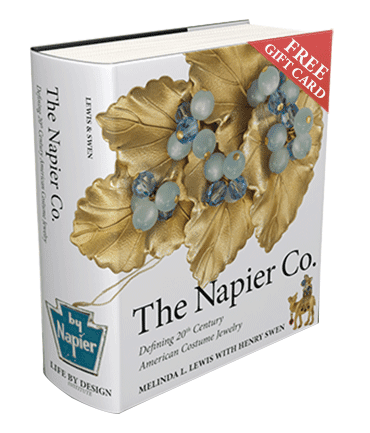 The company has just released a new resource book about Napier jewelry. The Napier Jewelry book is an encyclopedia of Napier Costume Jewelry. It tells the (before now) untold and phenomenal story of The Napier Co.’s inception, development, flowering, and ultimate success. The book is written and resourced by long time jewelry collector Melinda Lewis. The book chronicles the history of its management, manufacturing, marketing, and most importantly, the unparalleled beauty of Napier fashion jewelry. With approximately 4000 pictures of Napier jewelry history and over 250,000 words of text and descriptions, you will be taken step-by-step, decade by decade, through the development of the Napier style. As a collector, you will learn to recognize the findings, materials, and designs to appropriately circa-date the Napier jewelry in which you are investing. As a lover of vintage costume jewelry, you will enjoy the drama and excitement of the trials, tribulations, and breakthroughs at each stage of the Napier journey. In the end, you will have a deep and lasting appreciation of the romantic story infused into the metal, gemstones, crystals, cabochons, and elegance of each piece of Napier jewelry that you own or are considering owning. The book not only talks about the Napier jewelry company but also the fashion jewelry industry as a whole, so it is a must read for all collectors of vintage and costume jewelry. Here is a YouTube video which discusses the book and gives some photos and images from it. My experience in collecting vintage has shown me that, once a designer is featured in resource books, the value of the pieces go up over time. Perhaps now is a good time to start collecting Napier jewelry while it is still quite affordable. 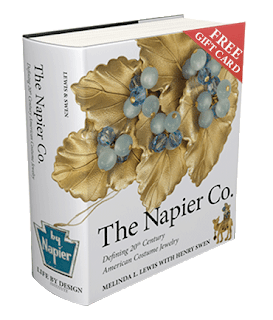 The book gives fair market value of most pieces made between 1950 and the year 2000 which will be a great help to anyone deciding to start collecting Napier Jewelry. The book can be purchased directly from the Napier Jewelry Company. Are you a fan of Napier Jewelry? I have been trying for years to get approved to sell jewelry on Amazon. Most categories are available to anyone who wishes to sell there, but a few are closed categories which require approval before you can list items for sale in them. This year, I finally got approval and have opened a store front on Amazon called Jewelry Lane. The store will feature only new jewelry. The vintage category has been closed for many years and Amazon is not allowing any new sellers to list vintage items. Since my other stores are a mix of both vintage and new costume jewelry, this is not a problem for me. I opened the store in early January and am in the process of listing items. It is a slow process, since Amazon is very strict about the terms and conditions under which you can list items. I currently have about 150 items for sale, but I plan to extend my range of jewelry to approximately 800 to 1000 items over the next 6 months or so. Here are a few of my current listings. You can click any of the pictures to go to the item page. These are just a few of the many selections. You can view my whole catalog in my Jewelry Lane store. Do you sell on Amazon? How do you find the experience compared to other venues? There are many styles of necklaces available. Everyone knows what a pendant is, but a lavaliere pendant is one that you may not be aware of. The term lavaliere is used for necklaces (and also brooches) which have a pendant that has a dangling tassel or stone hanging below it. The word was made popular in the mid 17th century by the Duchess de la Vallire, who was a mistress of King Louis XIV of France. 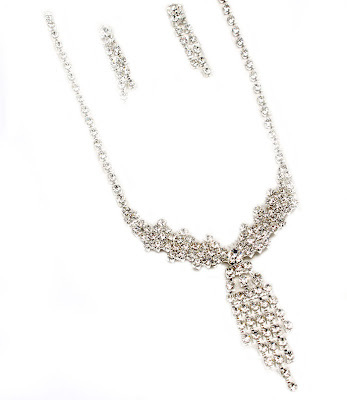 In the jewelry world the term has been shortened to lavaliere, or lavalier. Either spelling is correct. Many stones can be part of the dangle but pearls are one that is commonly used. I've seen lovely aurora borealis tear shaped glass stones, used in conjunction with a pendant or even brooch with dramatic effects. 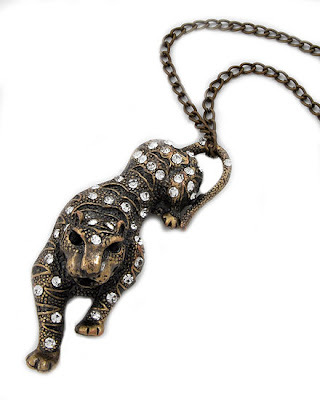 Occasionally the word will be used for pendants which have dangles within a part of the design rather than below it. I have also seen two strand necklace, each with its own pendant described as a lavalier necklace. To be technically correct, there should be a dangle though, as part of the design, not just two separate pendants. 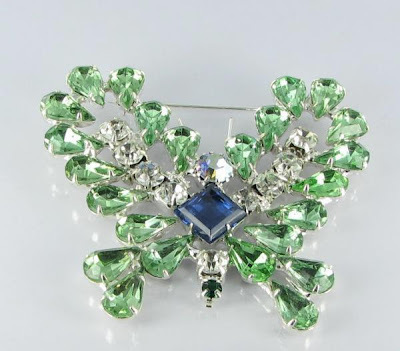 Kenneth Jay Lane dramatic lavalier rhinestone brooch. Egyptian Inspired necklace with Lavaliere dangles. 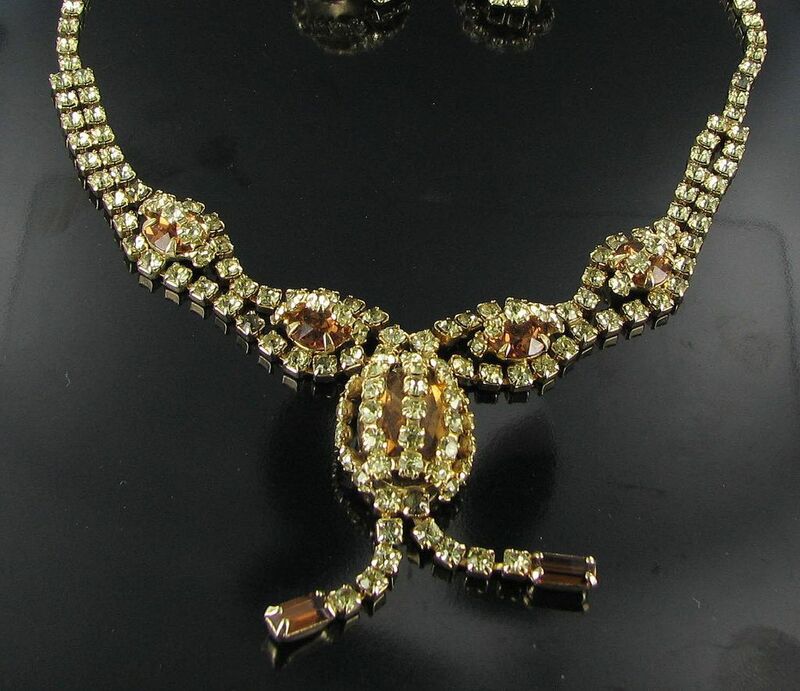 Lovely rhinestone mid century lavaliere necklace. 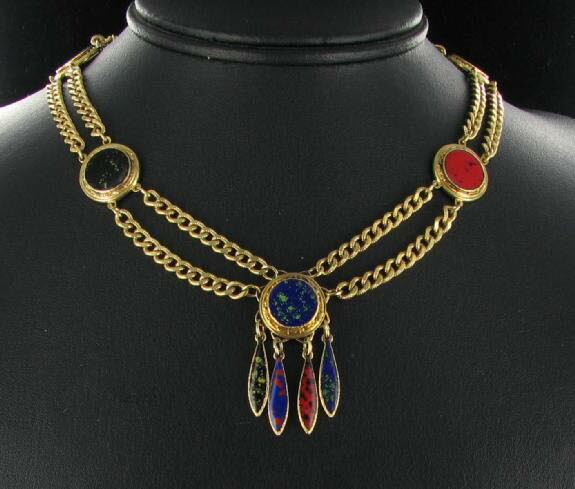 I have lavaliere jewelry in my Vintage Jewelry Lane store at very competitive prices. What do you think of the design technique? Do you like the dangles or prefer a plain pendant? I have been learning a lot about the various social networking platforms since I started my website with my friend Linda. The website is called Networking Tips 4U. It has articles on all of the social sites such as Facebook, Pinterest and Twitter. Twitter is one of my favorites. It's not everyone's cup of tea but there is something very appealing to me about saying what I am thinking in no more than 140 characters. Trying to stand out on Twitter is quite difficult. There are millions of tweets done every day. I am always looking for something new and different with a creative edge to it to give my followers something they might want to retweet. I just wrote an article for our networking site which talks about Tweet clouds. Tweet clouds are small cloud shaped formations which contain the words you have used most in a time period. You can read more about Tweet Clouds and how to make them on this page of our website. 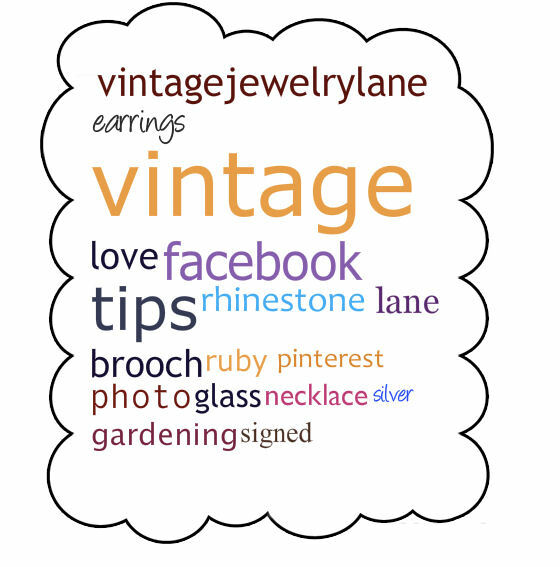 Here is my latest one that I did for my jewelrylane twitter id. I've been listing today and tweeted some of my latest listings so the materials and jewelry types are showing up in the cloud. I'm sort of artistic, so I have a fondness for the cloud shape but the other one appeals to me too...mostly because it is a teal color. Which type of Tweet cloud do you prefer? I'd love to hear from you in the comment section below. Vintage Jewelry Designer - Who Am 1? Time for some fun again. 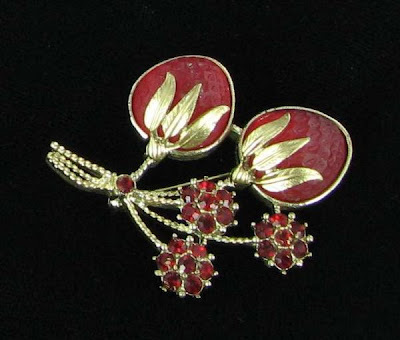 This is another in my ongoing guessing game blog about vintage jewelry designers. I'll give you some clues and pictures and you see if you can guess which designer it is. Ready? I am considered a high end designer of copper jewelry. I returned to Spain in 1967 and continued making jewelry until my death in 1990. I am considered the star of the Modernist jewelry movement. Valentine's day will be here before you know it. It is a day to show your love in many ways. How about one of these pieces of heart jewelry? The heart has long been used as a symbol of the human spirit at its core. At one time it was believed to be the seat of the human soul. What better symbol is there to represent love? In traditional art and folklore, the heart symbol has been a stylized design. Normally, it is colored red, which suggest both blood and strong passion. It is the most often seen symbol on Valentine's day cards, as well as those candy boxes that show up in the grocery stores this time of the year. All of my shops have a lovely range of heart jewelry. Here are some to tempt the romantic in you. From my Etsy store - this lovely heart shaped pin with a single red rhinestone accent. This lovely pin from Vintage Jewelry Lane has a domed red center surrounded by hearts. 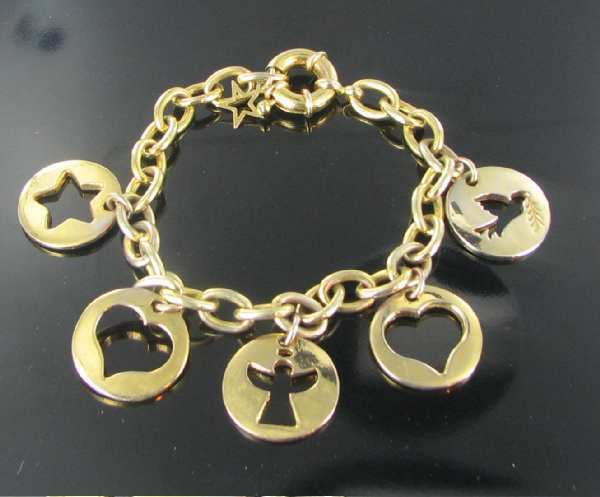 Pretty chunky charm bracelet with heart charms. Very chic! 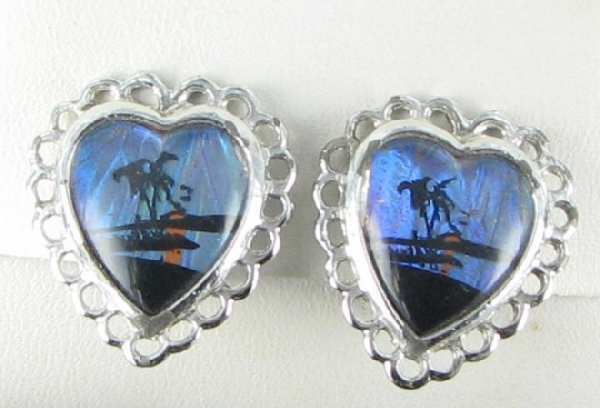 These unusual earrings have a heart shape and are made from genuine butterfly wings! Very collectible! 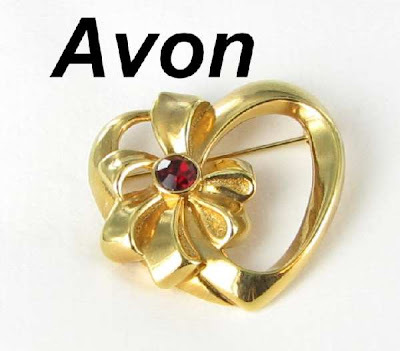 For more heart jewelry, please visit Vintage Jewelry Lane. Our main store has a wide range of heart jewelry in all styles. What about you readers? Do you find the heart your favorite symbol of romance, or do you prefer something else? Please let us know in the comment section below. 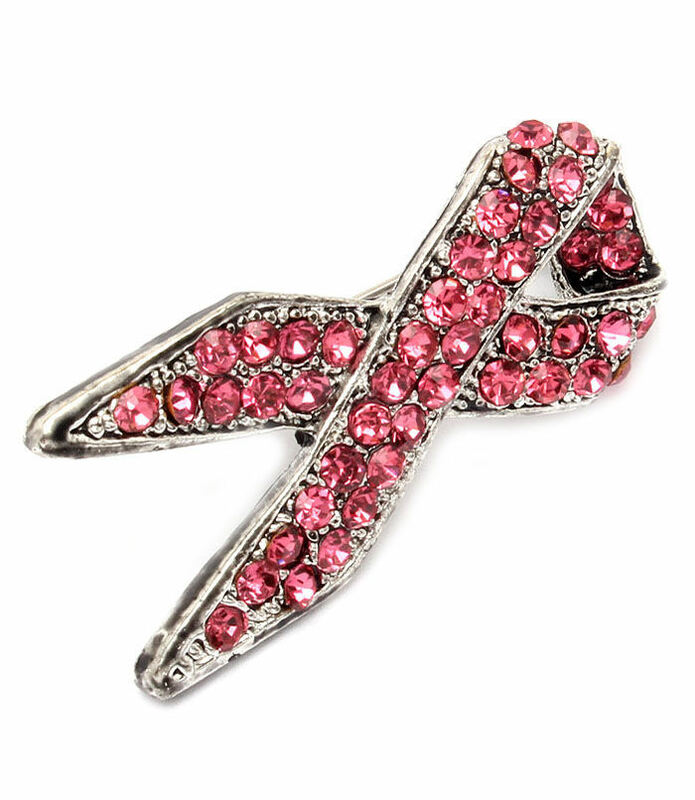 Have you ever seen jewelry which is covered in rhinestones that aren't exactly black or gray but have a gunmetal style of finish to them? If you have, you are probably looking at a piece of jewelry with marcasites. 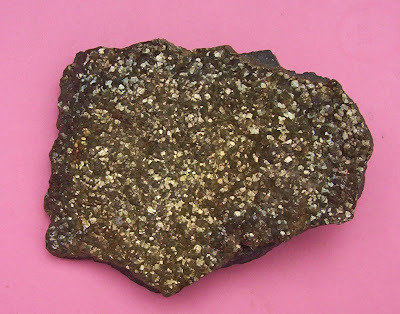 Marcasites are a type of stone, often used in sterling silver jewelry, and very often faceted. This mineral has the same composition as pyrite (fool's Gold) but has a different chemical structure and color. It is a gunmetal gray color with a shiny finish and is inserted in the same was as a rhinestone is. You may have heard of fool’s gold. Marcasite is the white form of fools gold. Marcasite jewelry was especially fashionable in Victorian times. 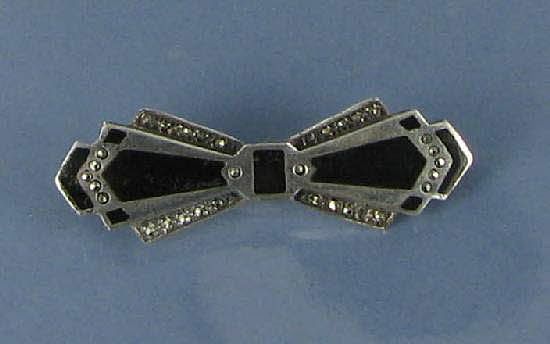 Jewelers usually describe marcasite as a bronze or gunmetal color, and the designs often resemble an “Art Deco” period. Some jewelry is described as being made of marcasites when in fact it is actually an imitation variety. In the real thing, the marcasites are individual pieces of gemstones set into small settings. In faux marcasites, they are made of small areas of metal made to give the impression of the genuine stone. 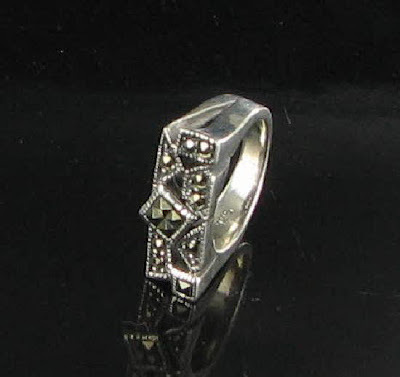 Faux marcasite jewelry can be acquired for a much lesser price than real marcasite jewelry. Here are a couple of examples of genuine marcasite jewelry. This last image is a Kenneth Lane for Avon piece with Faux marcasites. What do you think of the look? Do you prefer clear bright rhinestones or are marcasites something that is more your cup of tea? I'd love to hear your comments below. I am always looking for new and interesting reference books which deal with the topic of collecting vintage jewelry. There are many of them out there, and I have written about some of my favorites in the past. Inside the Jewelry Box, volume 1 is one that I have and would highly recommend. It is especially helpful for those who are looking for information on some designers who aren't mentioned in the more widely known reference books. Some designers not often mentioned who are featured in this book are Les Bernard, Louse of de Lillo, Claudette, Mazer Brothers and many others. The book also features designers who are more well known but also very collectible, such as Hobé, Florenza, and Hattie Carnegie. This book is based on the author's informative and interesting news columns that have run in antique publications across the country since 1997. 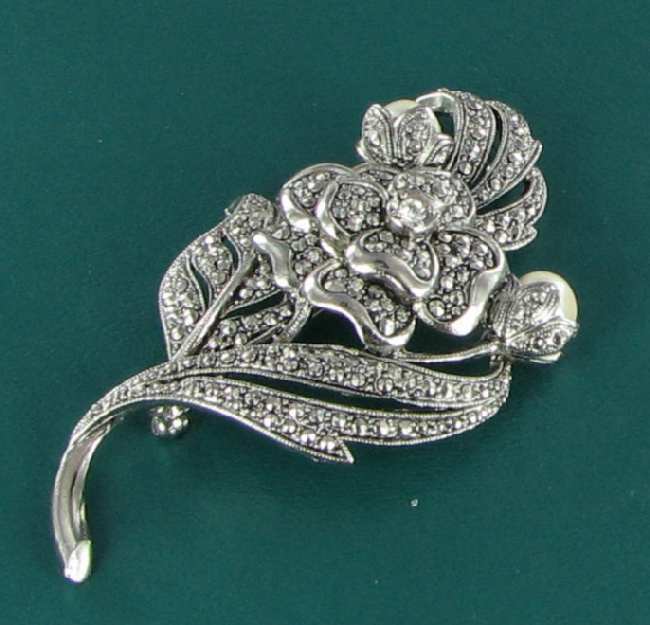 These articles are presented here, along with photographs of hundreds of pieces of vintage costume jewelry with descriptions, designer names, and current collector values. 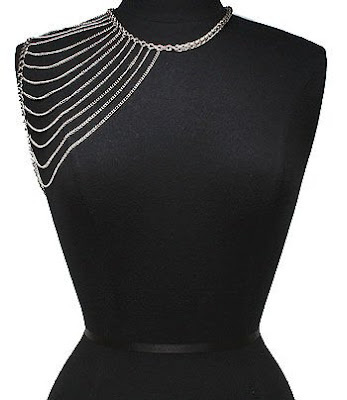 A section on costume jewelry on the Internet is also included, which profiles in detail, the best costume jewelery sites on the web, including biographies of each dealer and a synopsis of what makes the sites special. There are also hints for those wishing to sell their jewelry at auction. There are even vintage costume jewelry advertisements to add pizazz to the book. 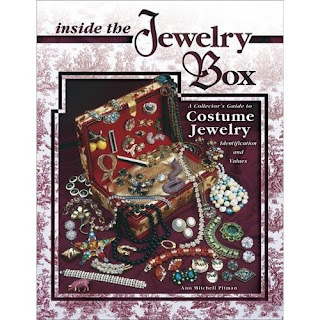 Finally, an informative section on where to buy replacement stones, how to restring beads and pearls, how to repair costume jewelry, and how to join vintage costume jewelry clubs rounds out the book. 2004 values. The book is available from Amazon and other leading book dealers nation wide. It is the weekend. Time to head out for some well needed fun time at the mall. Or better yet, why not save that time and see what is available online in the jewelry stores. Then you can spend the rest of you weekend doing some other things you love to do. 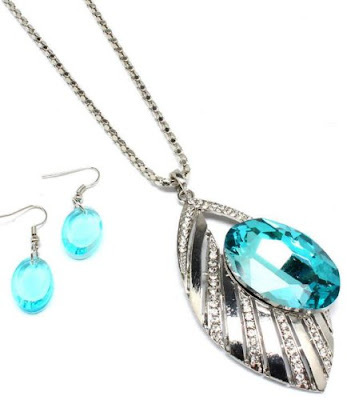 Here are some of my Sensational Saturday jewelry specials. All are limited to just one piece, so hurry to the website if they appeal to you. They won't last long at my competitive prices. 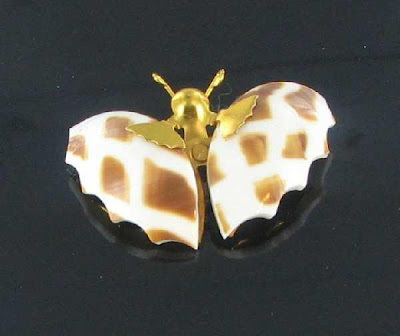 This pretty glass butterfly has been reduce to only $11.99. What a sweet little critter. "Strawberry Festival" By Sarah Coventry. A lovely pin reduced to $19.99. 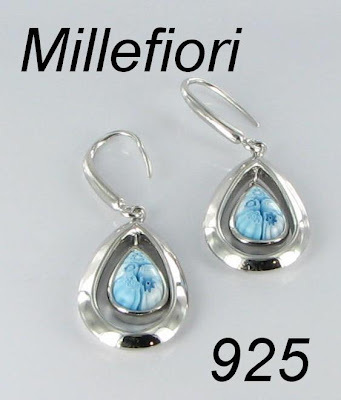 Millefiori Sterling Silver Blue earrings - reduced to $65. 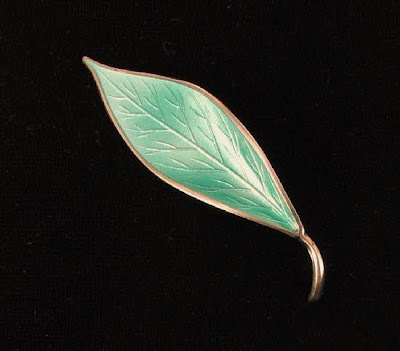 Kenneth Jay Lane Unsigned Green Glass Butterfly pin - reduced to $32. These are just a few of the current specials. You can view all the mark downs on the specials page at Vintage Jewelry Lane. 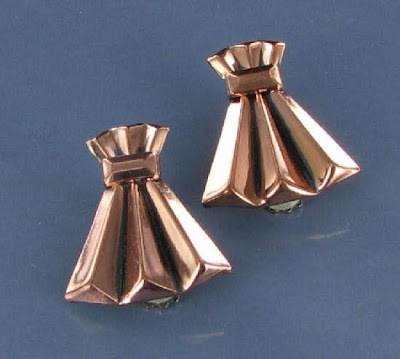 I have spoken about the famous copper designer Jerry Fels who founded the Renoir line of copper jewelry before. In my opinion, he is second only to the master Rebajes who preceded him. 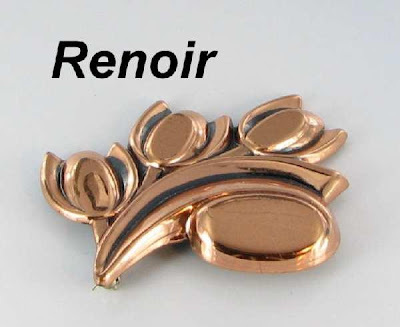 Renoir copper designs are well known for styles which had a huge influence from nature. Many styles of leaves and flowers and animals ended up as Renoir creations. In the spring of 1952, The Renoir of California line was expanded when Fels introduced the Matisse Ltd line . These are some of my personal favorites from the Renoir lines. 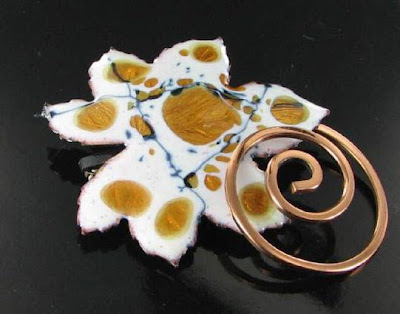 They combine the traditional copper with hand fired enamel for some spectacular looks. Renoir jewelry is very collectible, in part because of their beauty, but in large part because of the quality. The pieces that I have in my collection look as good as they must have when they were made. Here are a few of my favorite Renoir and Matisse Renoir designs. 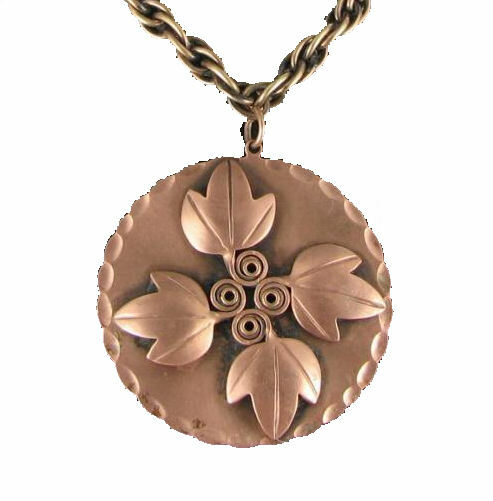 All are available from my Vintage Jewelry Lane website in the copper category. 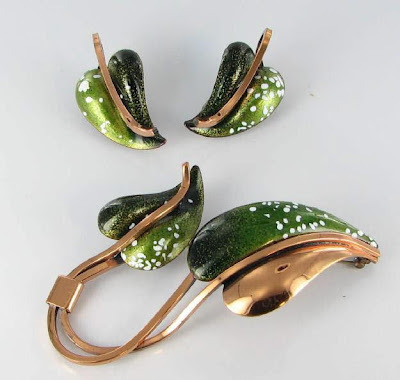 Matisse Renoir white and tan copper leaf Pin - Book Piece Called "Leaf"
Matisse Renoir copper and enamel pin and earrings set called "Leaflet"
Renoir mid century copper brooch called "Tulip." 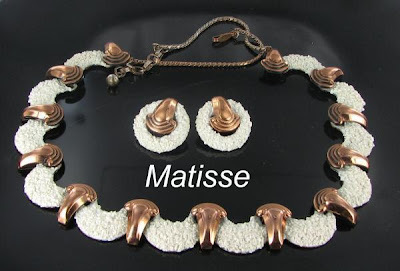 One of my Favorites - Matisse necklace and earrings set in sea foam and copper, called "California Dreaming." Very collectible set. If you would like more information on Renoir designs, my favorite reference book is called Copper Art Jewelry, A different Lustre" by Matthew L.Burkholz and Linda Lichtenberg Kaplan. It is available from Amazon and other leading book retailers. Do you have a favorite copper jewelry designer, or do you also love Renoir pieces? I'd love to hear from you in the comment section below.